Erich K Ritter, PhD, is a shark behaviorist focusing on experimental shark-human interaction and the body language of sharks, with special emphasis on accident (attack) reconstruction. 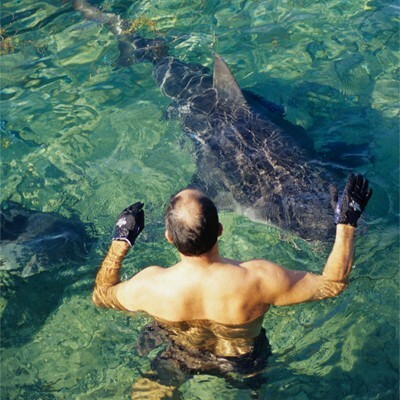 He is considered the world's top authority and pioneer in the field of shark-human interaction. He developed the first interaction concept - called ADORE-SANE - for swimmers, divers and snorkeles that allows safe interacting with any shark species under different conditions. Erich Ritter (2012) Shark-Human Interaction: This is the very first shark book ever focusing on one single topic: you facing a shark, and have to interact with it - voluntarily or not. What do you really have to do when a shark comes too close, how do you read a shark and what do you have to look for, what does it mean when an animal flickers, tilts, yawns, chafes, bumps... or approaches in a frontal manner rather than a lateral one, why inner and outer circles matter, what to look for in the inter zone, how to withdraw correctly and much more. This book summarizes everything known about shark-human interaction, written by the world's authority in this field, shark behaviorist Erich K Ritter, PhD. Written in a very concise manner, pact with factual knowledge, explanations of the latest discovered behavioral patterns, tested recommendations and interception rules, a guide of how to act with the 30 most likely to encounter species worldwide, and more than 200 pictures, drawings and bullet lists, make this book the most valuable shark book to have for swimmers, surfers, divers and every beach goer enter the water. Find out more about Erich Ritter at http://www.LetsTalkShark.com.